WORCESTER, Mass. – Franklin got the look it wanted to try and win the game. Down by one with less than 10 seconds remaining, Erin Quaile swung the ball around the perimeter to her backcourt partner Shannon Gray, who looped the ball into Ali Brigham on the left block. The 6-foot-3 junior center, who had 28 points to that point, turned into her smaller defender, took a dribble, and got a look at the rim. Unlike so many other chances that Brigham converted in Friday night’s Div. 1 Central final at Worcester State University, this one didn’t find the bottom of the net. Instead, it kicked off to the far side, but her classmate Megan O’Connell was there and pulled down the offensive rebound between three Wachusett defenders. O’Connell instantly went back up with an off-balance shot. It bounced on the right side of the rim, took a touch on the backboard, and dropped through to put Franklin ahead 61-60 just as the final horn sounded on the program’s first-ever sectional title. When the ball dropped through the basket, O’Connell seemed to hesitate for a second before the celebrations kicked in, as though she wasn’t sure if she had really just done that. That she had just won the game. “I was in shock. I didn’t really process that it went in,” she explained. There were points in the second half when it looked like Franklin may run away from the Mountaineers and cruise to the title. But, Wachusett came in undefeated for a reason and stormed back in the fourth. A 4-0 run to close the third was followed by four more to start the final quarter with junior Belle Lanpher (21 points) getting a steal and then a transition basket to cut the lead to 47-45. Brigham answered back with a basket plus the foul and senior Bea Bondhus (10 points) knocked down a pull-up jumper from the right to push the lead back to seven. A jumper by Rachel Vinton (14 points) was matched by a Brigham layup, off a feed from O’Connell, to keep the Panthers up 54-47. That was when things started to get very interesting. Lanpher drilled a straightaway three to cut the lead to four points and Vinton halved that with a pair at the line. Again, Franklin turned to Brigham, who added 14 rebounds and seven blocks to her game-high point total, and she responded with a basket from a Gray assist. A layup for Jill Post made it a two-point game and then Courtney Lanpher (14 points) buried a three to put the Mountaineers up 57-56. It was their first lead of the second half. Bondhus got fouled in the backcourt and, despite the cacophony of noise from the Wachusett student section, buried two clutch free throws with 1:19 left to give the Panthers back the lead. Courtney Lanpher was fouled and knocked down a pair at the line to make it 59-58 with 1:06 left. After another foul, Gray (seven points) hit 1-of-2 to tie it with 1:01 remaining. The score stayed the same until Lanpher was fouled going to the basket with 15.1 on the clock. She missed the first and Leighton took a timeout. The senior guard made the second and instantly Wachusett went into its press. Quaile got free to get the inbound and pushed the ball up court, where the Panthers got the ball into Brigham’s hands and then O’Connell provided the heroics. Wachusett came out firing and took an early 10-4 lead in the first. The Mountaineers scored 19 points in the opening quarter, mostly using a high pick-and-roll in the center of the court. Franklin was aggressively jumping out to the shooters and the Mountaineers were able to turn the corner time and again and get to the rim, where Brigham was nowhere to be found because she was forced to extend out. 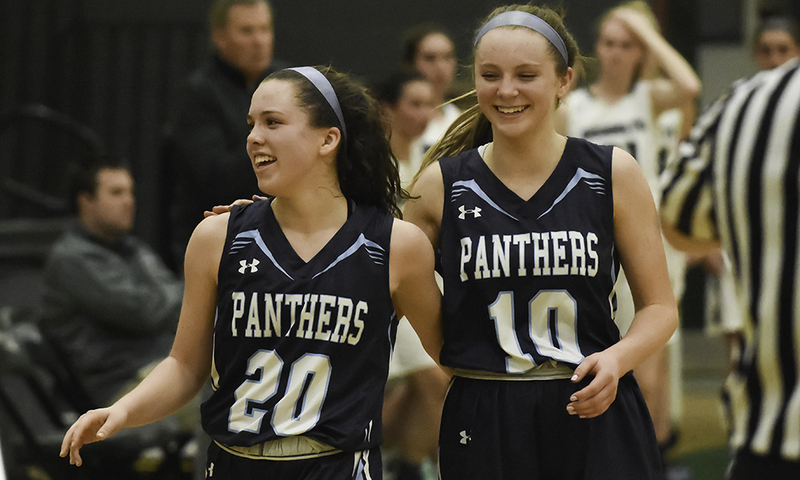 The Panthers changed things up defensively in the second and held Wachusett to just 10 points in the quarter. Brigham was on fire early in the game, as the Panthers got the ball inside early and often. O’Connell (10 points and nine rebounds), fresh off a 19-point game in the semifinal, was also getting free and taking the ball to the rim. Gray nailed a three in the final seconds to tie the game at 19-19 after one. In the second, Franklin’s outside shooting started to find the range. Bondhus and Quaile each hit threes and Brigham added another six points as Franklin pushed the lead to as many as 10, 35-25. A quick 4-0 run at the end of the half got the top seed back within single digits at the break. A Belle Lanpher three cut the Panthers advantage to 40-37 in the third, but then Franklin went on a 7-0 run to again push the lead to 10. Brigham got an offensive board and put-back and Bondhus drilled a three in the run. But again, Wachusett was able to score four straight to get back within six at 47-41 and set up an exciting finish to this rematch of the 2015 Central final. 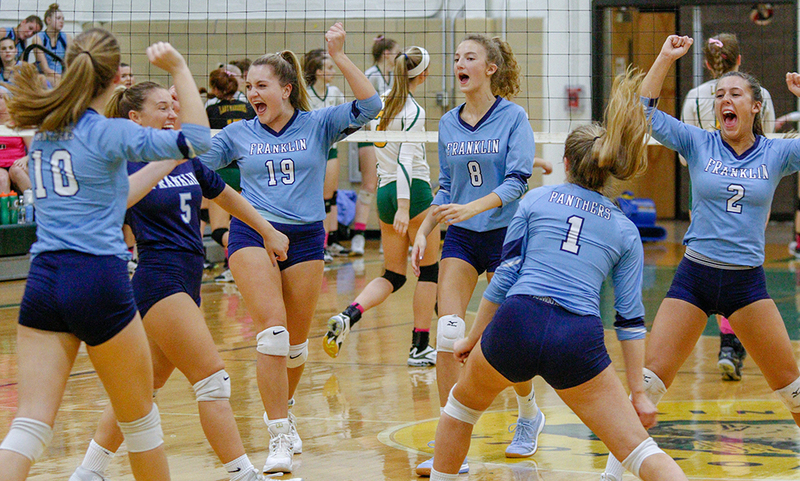 Franklin (20-4) now advances to the state semifinal for the first time and will face West champion Springfield Central. WORCESTER, Mass. – When the ball swung around to Franklin guard Shannon Gray right in front of the Panthers bench, her teammates started to rise in anticipation of a shot. But Gray hesitated and passed it back up top. Franklin coach John Leighton urged the senior to let it fly when she gets the chance. Gray heeded that advice and she knocked down a pair of threes on back-to-back possessions to stretch the Franklin lead from just four points to double digits. She knocked down three of her team’s five shots from beyond the arc in the second half, helping the Panthers pull away for a convincing 59-43 victory over No. 2 seed Concord-Carlisle in the Div. 1 Central semifinal at WPI’s Harrington Auditorium. 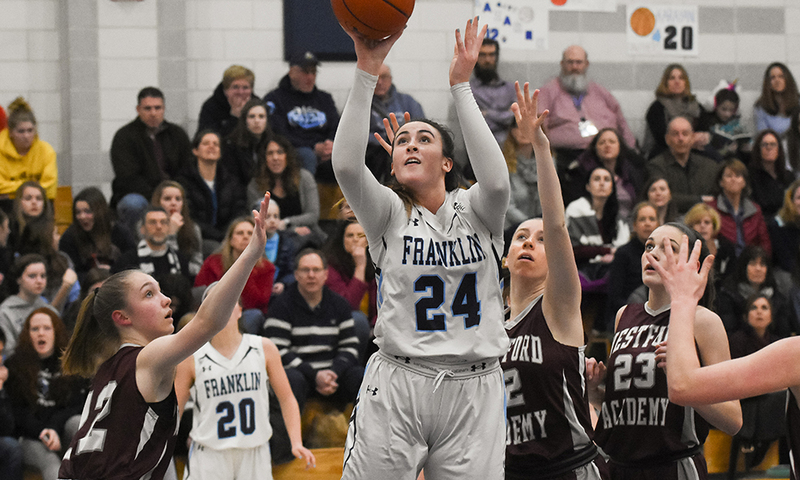 At halftime, Franklin held a slim, two-point lead over the Patriots and that was entirely because of two players, junior center Ali Brigham and her classmate Megan O’Connell. The Panthers opened the game with a 10-0 run, as O’Connell took advantage of the attention on Brigham in the paint to find driving lanes. Brigham added an and-one off an offensive rebound and had four points in the first, but O’Connell was the aggressor in the paint and on the glass (13 rebounds), scoring 10 of Franklin’s 14 in the first. She finished with 19 points in the game. The Patriots crept back into the game, trailing by just six after one and then getting as close as two at several points in the second quarter. Franklin was determined to get the ball into the paint and Brigham (game-high 22 points, 14 rebounds, and five blocks) scored all of her team’s nine points in the period, twice scoring on put-backs and twice getting baskets at the rim thanks to O’Connell assists. While Franklin had the lead at the break, it was hard to envisage a trip to the final with only two players getting on the scoresheet, especially as the Patriots threw a variety of different defenses at Brigham in the post, almost daring the Panthers to shoot from the perimeter. That strategy worked for a half, but Franklin made the Patriots pay in the second half. After an O’Connell drive for two, Bea Bondhus knocked down Franklin’s first three, and her only shot of the game, to make it 28-21. Concord-Carlisle, which came into the game with only one loss on the season, cut the lead back to just four points but then Gray stepped up and knocked down a pair to suddenly make it a 10-point edge. Again the Patriots rallied with back-to-back buckets, but Brigham answered with a rebound and score and then Teagan Collins finished a break with a scoop shot off the glass. As the clock wound down on the third, Erin Quaile put a punctuation mark on the quarter by drilling a three at the buzzer to give Franklin its largest lead at 43-31. The Panthers scored nearly as many points in the third quarter as in the first two combined. That offensive barrage continued in the fourth. Brigham got a three-point play on a rebound and then finished off another rebound to make it 49-31. Corcnord-Carlisle hit back with five straight points, but then the Panthers put the game out of reach. Gray snagged an offensive rebound and made a nice dish underneath to a wide open O’Connell for two. Gray then stepped back outside and nailed her third three-pointer of the afternoon and O’Connell added two more with yet another rebound. Franklin (20-4) is making a second appearance in the D1 Central final, its first since 2015, and will face the top seed Wachusett. FRANKLIN, Mass. – Franklin head coach John Leighton was not pleased when he called timeout with his team trailing by 10 points in the third quarter of Wednesday night’s Div. 1 Central quarterfinal against Westford Academy. The Grey Ghosts had just knocked down their third triple of the quarter and eighth of the night and Leighton urged his team, which has allowed less than 40 points per game this season, to find another gear on the defensive end. The Panthers responded and then some. Franklin gave up only 10 more points the rest of the way, turning a 10-point deficit into a 10-point, 63-53 win that sends the Panthers into the quarterfinal. Franklin closed the game on a 30-10 run to earn its first playoff win since the team made a run to the Central final in 2015. Out of that third quarter timeout, Franklin went on a 7-0 run that instantly got the hosts back into the game. Olivia Quinn set up Ali Brigham for a basket to get things started and then Quinn added her only basket of the night off a Shannon Gray dish. Westford got two back, but then Brigham snatched one of her 15 rebounds and scored to make it only a three-point game heading to the fourth. 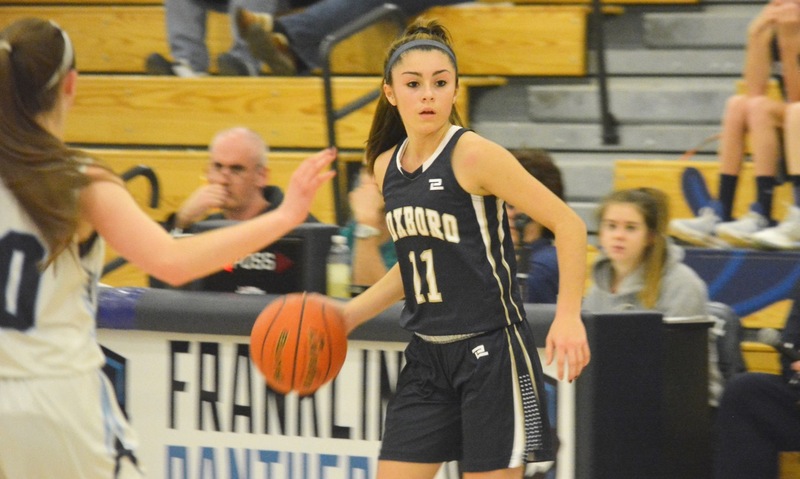 Erin Quaile completed the comeback for the Panthers when she buried a three-pointer from the left wing, her only points of the night, to put Franklin ahead 46-45. It was Franklin’s first lead since the second quarter. 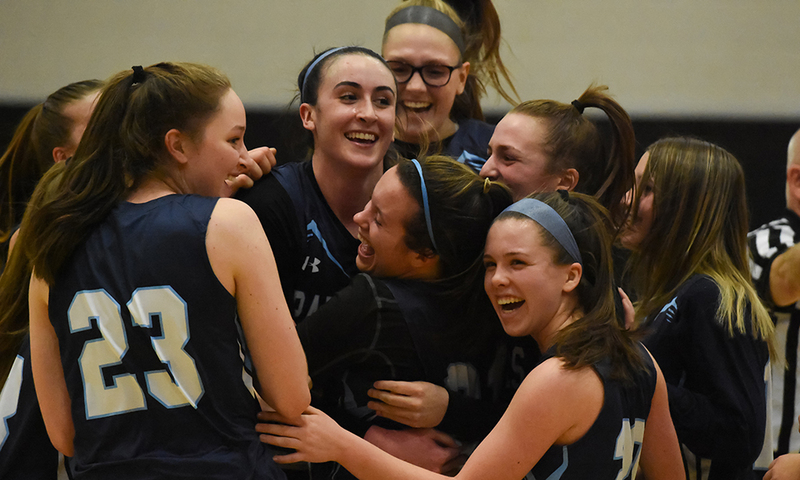 Jennifer Martin answered for the Ghosts with a step-back three, her fourth of the night, but momentum was with the Panthers and they answered with a long inbounds pass to Brigham under the basket to tie it. 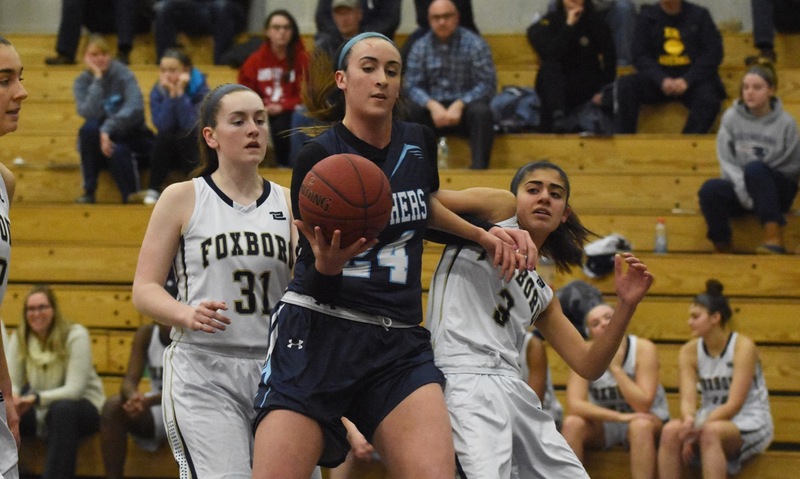 Brigham, who was recently voted the Hockomock League MVP, was dominant throughout and she grabbed another offensive rebound to put Franklin back in front. She finished with a game-high 33 points. She also got some help from senior guard Bea Bondhus, who scored seven of her 15 points in the fourth quarter to secure her first win in the playoffs and make sure this was only her final home game, not the final game of her career. Bondhus drained a three on a kick out from Brigham that put the Panthers up 53-51 and then she followed it with a pump-fake and drive to the basket that extended the lead to four. 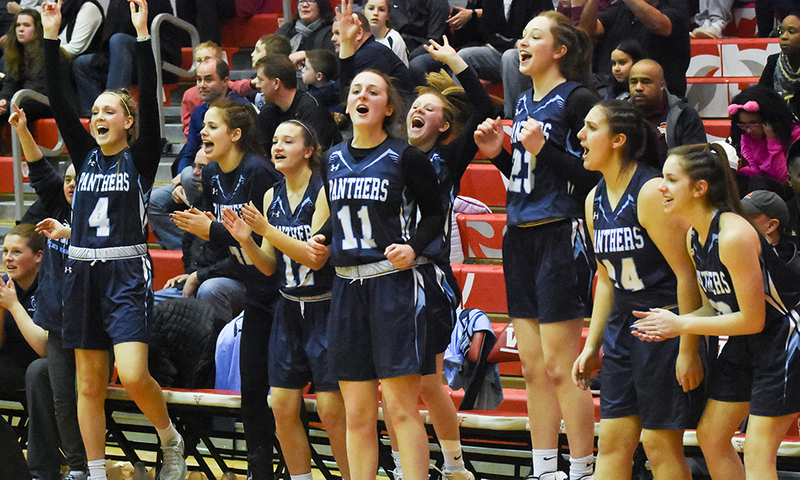 A pair of free throws by Brigham was followed by a jumper from Megan O’Connell, who had a rough shooting night up until that point, and the Franklin bench and the home crowd sensed that the Panthers were moving on. 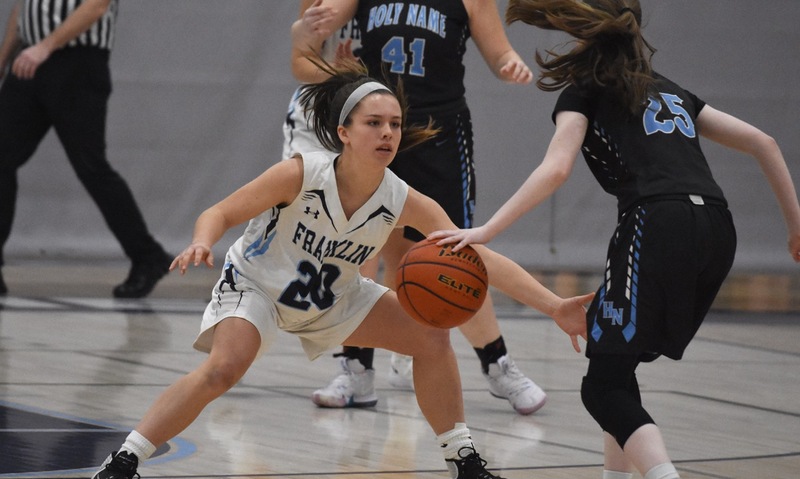 Three-point shooting had put Franklin in an early hole, as the Grey Ghosts knocked down four from beyond the arc in the first quarter alone. Despite Brigham scoring nine in the first, including a spinning pull-up jumper from the free throw line, and Bondhus adding five, Westford held a 16-14 edge. 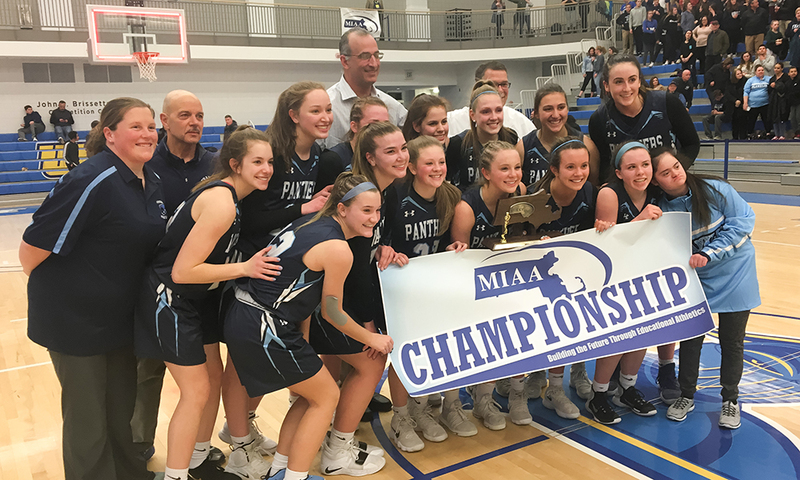 The Panthers kept forcing the ball into the paint to Brigham, who added another eight points in the second quarter, but on the defensive side of the ball Franklin was allowing Westford to control the boards and get second chance opportunities. The Ghosts extended the lead to 10 at one point in the second, but a mini-run cut that lead in half by the break. Brigham in the paint and Bondhus from three giving Franklin a quick five points. The threes kept raining down from the visitors in the third quarter until Leighton’s timeout and his insistence that the Panthers lock down the perimeter. Franklin (19-4) will take on No. 2 seed Concord-Carlisle on Sunday at WPI at 5:00.